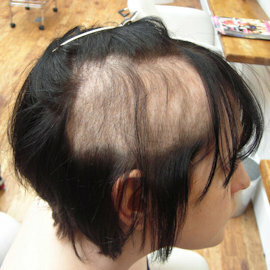 Trichotillomania (TTM or Trich) is an Impulse control disorder that causes overwhelming urges to pull out your hair. It is estimated that 2% of the world’s population may at some time suffer from this condition. It predominately affects women. Emily agreed to take part in a video diary project at The Lucinda Ellery Consultancy whereby she used our Intralace barrier system to manage and control her hair pulling. 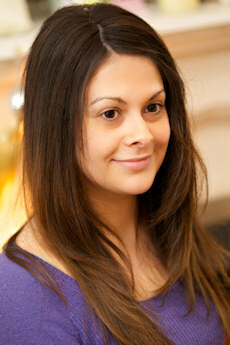 We interviewed and filmed her at various stages during her appointments over a 12 month period. Please view the videos below to see Emily's progress over this period of time. The Goal is Regaining Your Own Hair like Emily! The earlier the urge to pull is intercepted and controlled the better the chances of growing (and keeping) your own hair will be. We have clients of varying ages visit our locations in the UK and US so we can help them manage their hair pulling through the use of our Intralace System™. 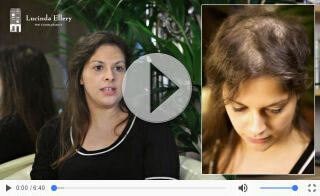 The Intralace System™ is not a cure for Trichotillomania but it can help as a physical barrier and many clients like Emily have managed to successfully regrow their own natural hair whilst using the Intralace system™ and in many cases have become pull free. 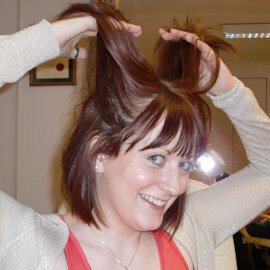 Lucinda and her experience in managing Trichotillomania! 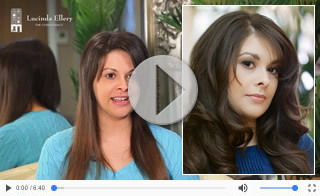 In the video below, Lucinda Ellery discusses Trichotillomania and her experience in helping women and teenage girls manage their TTM. It's a very very complex disorder. Many years ago it was considered to be an OCD, an Obsessive Compulsive Disorder, but in recent times it's now been classified as ICD, Impulse Control Disorder. It is a hair pulling disorder, in other words a person that may have it, has an irresistible urge to pull out their hair - sometimes without even knowing that this is the case. It's considered to start at 10 or 11 on average but I've known it starting at a year, 18 months, younger. There's another level when it starts to kick off - 15, 16, 17, around the time when girls go to university and college; studying affects it. Recent figures from Professor John Grant who came to visit us here in England, indicate that 82% of those who suffer from TTM or manage it are female. There are tell-tale signs for parents that they could watch out for. I think there are several things that you need to be aware of, apart from the very obvious collection of hair under your daughter's bed or around a settee where she sits or the floor. You might find that your hoover is filling up massively with the amount of hair. Your child might be surprisingly intelligent - above average. She may also be deeply sensitive: this is very much the current feeling about how girls with TTM exhibit these qualities. Highly intelligent, above average. Deeply sensitive. Very difficult situation to deal with. So if you have a daughter that seems to be very intelligent, and also is very sensitive, and you're finding piles of hair around somewhere, it might be good to dig a little deeper - very, very carefully because it's a very unusual subject to deal with. It's kind of a sensible thing if you're looking to understand sites that girls might go towards, people might go towards. It's probably a good idea to understand how it kind of works. Very often a person might start with eyelashes, extracting eyelashes; they might migrate to eyebrows, and then eventually migrate to the hair; on the crown of the head or behind the ears. These are very very much the standard, if you like, features throughout. If you take photographs of the backs of girls with TTM you'll often see the hair at the back is untouched. You can have critical TTM i.e. a full head of hair removed - I've known of a person that removed a full head of hair in five hours - and then you can have mild TTM, where you might just pick on your arms or legs. It really is as long as a piece of string, and it's about the same as someone who's about a stone overweight and 22 stone overweight - the variances are very great. The majority of the girls will keep it secret, when they're very young a parent might be aware that they will usually object to having any reference made to it, and very often families will just calm down and quieten down about it because there's a kind of barrier, if you like, of talking about it. So it's a very big secret, and some I must say, keep this secret for forty and fifty years. 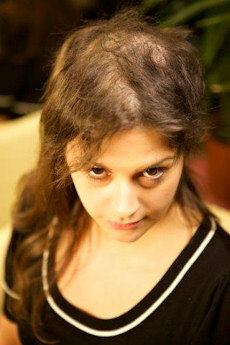 And it is private - hair loss for women is a very private issue. Doubly so if you're in the situation where you have self-blame - my hair, my hands, my fault. 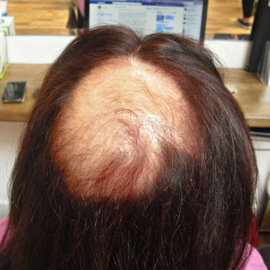 Women express great feelings of shame, humiliation and embarrassment that they are actively pulling out their own hair. From the research that I have made over the years, the girls themselves, even when they've ceased the activity, always feel a bit anxious and nervous that it might come back very very quickly. So it's a bit like alcoholism, there's no known cure for alcoholism and there are millions of alcoholics who don't drink. So it's my belief that you may indeed have all the qualities of TTM, and miss out the pulling bit. I believe there are ways to avert that. Techniques like breathing - deep breathing - really really helps. There are lots and lots of ideas from various people that you can incorporate, but I have found that rubbing the thumbs here, around and around, the girls that use this and make it a habit; it is exactly the same feeling you get when you separate a single hair. So by learning to do this rubbing and rolling and thumb soothing - when you're listening to a lecture, sitting on a bus, riding on a train, plane or anything, and build it up as a habit to sort of sneak into the nervous system where all of this sits, it sort of makes you calm down, you can actually feel it if you practice it, brilliant. Another technique to help reducing impulses and managing them, it getting yourself a really big darning needle - one that does not puncture the skin but creates a sensation - and by needle tapping in and around the area, it can send a shudder that very much emulates the same feeling as an extraction of the hair. So together with the feeling of searching and looking for a hair (the thumb technique) and the needle tapping, it very very closely resembles the same process of the seeking out a hair, extracting and fiddling with it. It feels very much the same. Knowing something about the structure of hair is very useful. Each follicle is designed to come back twenty-two times and last for six years, so repetitive pulling begins to age the hair and it starts to get crinkly and grey, which are very attractive hairs to actually feel and pull - so that doesn't help the situation. But literally as time goes by, with repetitive pulling, the hair comes back thinner and weaker and eventually fades altogether. But it does depend on the type of hair you have to start with, the quality, the amount, all sorts of things. The youngest girls I've come across with TTM scarring, i.e. permanent damage, could be in their mid-twenties - early to mid twenties - when they've had very, very chronic TTM. Anything that you feel could help you - doesn't matter how crazy it sounds - you know if it helps and it gets you calm then go for it. CBT - you'll need to register with your doctor, it is part of the NHS, it might take quite a while to actually get it, but do pursue it - you're entitled. Hypnotherapy - works in conjunction with other things. There's no doubt that going towards Yoga, Pilates and Meditation really helps with the impulses, as does frantic exercise like Zumba and running. All of these things seem to expel energy, and they do help with managing your TTM. Definitely book into your doctor, register that you have this condition. Don't be too surprised if they don't have a huge amount of knowledge about it - it's still a secret and very private - but register and also register to go for your CBT; you are entitled. You're also welcome to come and visit us here at the Lucinda Ellery Consultancy where we've helped thousands of women over the years, and we will give you whatever advice we can. ‘I started pulling my hair out around the age of 16. For a long time I thought I was the only person in the world that did it, and was very secretive about it. I soon found out through the power of the internet what Trichotillomania was, and that I was not alone. However, it still took me a long time to admit I had a problem rather than a bad habit I could look past, and even longer to talk about it openly - in fact, it was only when I was 25 that I finally opened up about it to my family and friends. The moment I did I felt much freer, and it was the first step to getting help with my condition. But after so long of doing it, my hair pulling had been gradually getting worse and worse, and I developed bald patches that were increasingly difficult to cover up. I’d seen a documentary about the Lucinda Ellery Consultancy called ‘Girls on the Pull’ and decided to get in touch. I had the Intralace system fitted in November 2014 and almost cried when I first saw my new hair - it was the first time in a long time I’d had a full head of it! My life changed dramatically - I no longer had to spend hours in front of the mirror ensuring my hair was all in place so that no-one could see my bald patches. I felt confident for the first time in so long, as I no longer had to worry about people noticing. The Intralace system also created a barrier so I could not pull my hair out. There is no cure for TTM but I'm so grateful to Lucinda Ellery for giving me a system to help manage it and keep it under control. When I first got the system fitted it felt a bit strange, but I got used to it really easily. It was easy to look after and I could wash and I style it as I would my own hair. I got so many compliments from my family and friends. It really helped stop me pulling - due to the barrier as well as having a full head of hair again and never wanting to go back to where I was!!!! When I saw how much my own hair had grown back underneath the system I was overwhelmed. Now, 12 months later I have had my Intralace System removed and have some extensions to both act as a reminder in case I do get the urge to pull and also they help even out the length of my own natural hair. It hardly looks any different to when I had the Intralace system - except now it's mostly my own hair!!!! This lady first visited Lucinda Ellery when she was 11 years of age and then again in her late teens and is now pull free! At the Lucinda Ellery Consultancy we are continually trying to raise awareness about Trichotillomania so that more and more people understand the condition. Each year we have ‘national no pulling week’ which has always received welcome interest from the press. In July 2010 Channel 4 featured a documentary about the specialist services offered by Lucinda Ellery for clients with Trichotillomania. Girls on the Pull told the story of two of our Trichotillomania clients – Harriet and Amelia. TTM (Hair Pulling Disorder) is an impulse control disorder, which can negatively impact on your well-being, and very ability to function normally. Women with TTM often pull out their hair to help deal with feelings of anxiety, anger, and boredom. Hair is often pulled absent-mindedly, or simply as a result of being over-tired. Because hair is so vital to our own identity and esteem – and is even dubbed our ‘crowning glory’ - many sufferers feel remorse, shame and self-loathing after pulling. 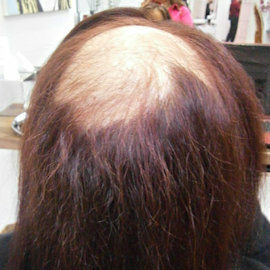 Damaging our own hair undoubtedly leads to severe anxiety, which can then spark a new round round of pulling. A truly horrible vicious cycle. We have clients as young as 16 and many girls do best in an Intralace System because the physical barrier of its mesh base actually prevents them from being able to pull hair from their usual sites. The emotional boost girls get from having a full head of hair that looks normal - from being able to do sport and swim without fear, and from fitting in at school again- is often remarkable. Looking good boosts their self-esteem, and reminds them how nice having their hair again is, which can help increase determination to stop pulling. We tend not to work with children younger than 16, as they are often not ready for the amount of care and attention required by the Intralace System™. But if you as a parent feel your daughter is capable of managing the system, we would be potentially willing to consult under-16s on a case-by-case basis. Self-care and help is another avenue we encourage at Lucinda Ellery, and we believe in the possibilities of working with a Cognitive Behavioural Therapist or other therapeutic professionals, meditation and stress-management classes. Physical exercise, like dancing, swimming, running, hiking, yoga and Pilates are also important for human well-being. Not only does healthy movement give skin a lovely tone and improve overall mood, but when combined with “new hair” it gives an enormous boost. Trich and the visible effects of pulling tends to take over women's lives, everything they do has to be considered with whether they need to cover or rearrange their hair. Preparing to go out takes longer, some activities are given up, even just walking in the rain or on a windy day becomes something to be avoided. We have often noticed the huge sense of relief that our clients express that they can be normal again – can do the things everyone else does without having to worry about their hair, even the simple acts of washing and styling without spending hours in covering bare patches gives them a sense of normality which helps them feel that they have turned the corner in their battle with this condition and can feel content again. After 25 years of experience, we are still continually humbled and feel immense gratitude in witnessing the positive impact our services have on our clients.